Description: Red Phalaropes are the most heavyset of the phalaropes and almost robin-sized. They have short, light colored legs, yellow-lobed toes and a short, yellow and blacktipped bill. Breeding plumage females have black and white heads, vividly striped backs and rufous necks and underparts. Males are duller in color. Nonbreeding birds are plain gray above and white below. A white wing stripe is apparent in flight. Similar Species: Distinguish Red Phalaropes from other phalaropes during the nonbreeding season by their chunky appearance, lighter colored back and head and thicker, shorter bill. 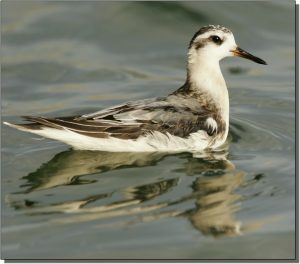 The phalarope shape, swimming behavior and their bill will separate them from Red Knots and Sanderlings when in breeding plumage. Comments: Red Phalaropes are circumpolar on the arctic tundra breeding grounds. Like other phalaropes, this species is polyandrous. They primarily spend the nonbreeding season in large groups on the open ocean. The most pelagic of the three phalarope species, Red Phalaropes are uncommon within the Great Plains.